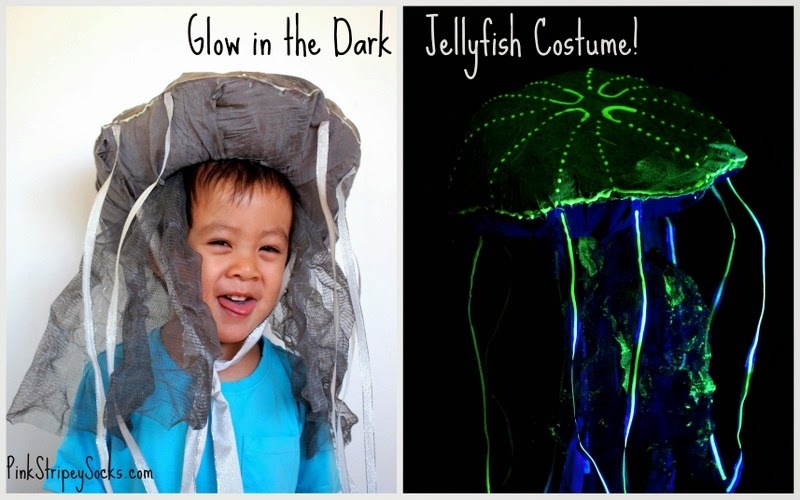 Let's Make a Glow in the dark Jellyfish costume! 2. Wrap your bubble wrap around the top of the hat. Use packing tape to keep it in place. 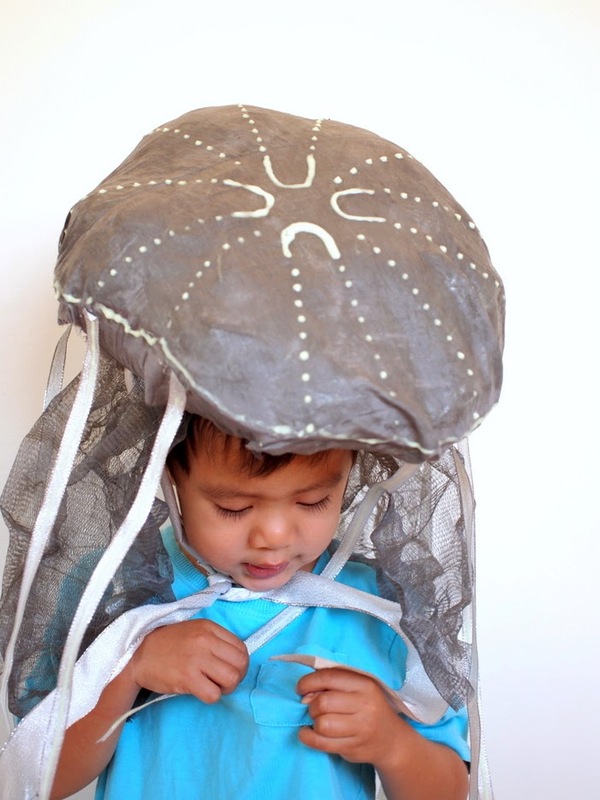 Make a jellyfish-shape dome. 4. Cut your thin ribbons out to create the jellyfish's tentacles. Tape the ribbons onto a piece of cardboard. Then, trace them with glow in the dark paint. 5. Cut up your loofa! Now you've got some curly tube bits for the jellyfish's middle. Wrap some cling wrap around cardboard. Then, slide your loofa over it. Now you can use a sponge brush to dab on glow in the dark paint onto the mesh! The cling wrap will prevent the loofa from sticking to itself and to the cardboard. 6. Cut up an old shiny shirt. 7. 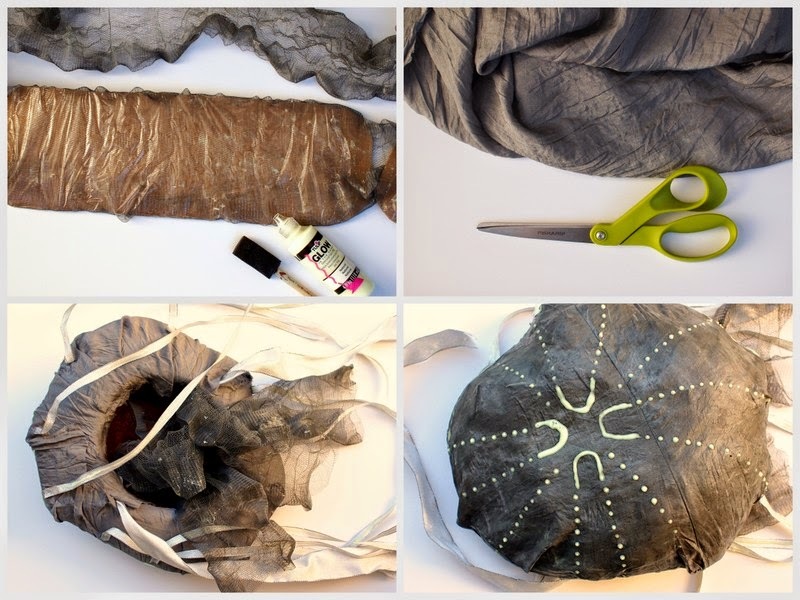 Use hot glue and glue the shiny shirt over the top of your jellyfish head. Then, glue on your thin ribbon tentacles. Then, tie a knot in the middle of your loofa bits. Use packing tape to attach your loofa bit (by the knot) into the middle of the hat. 8. 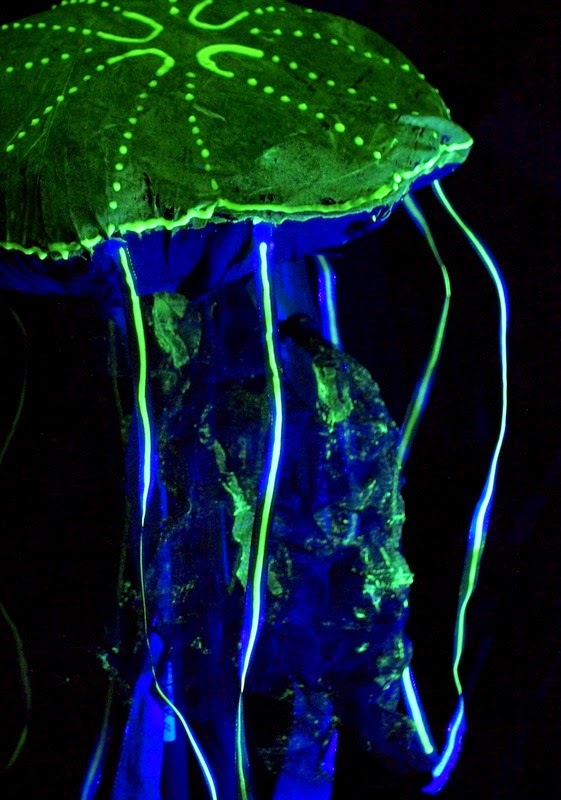 Use a sponge brush to cover the jellyfish head with paint. (I used 2 layers of paint to really make it pop.) Then, add extra details by squeezing the paint straight onto the head. Wait for it to dry and voila! 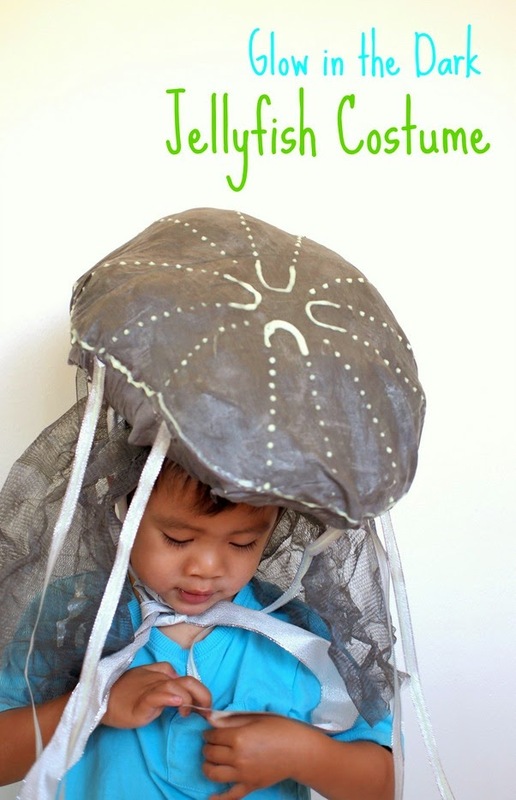 A unique DIY jellyfish costume! And then turn off the light, shine a black light onto your paint, and watch it really glow! Isn't it amazing? The glow in the dark paint really brings the costume to life. Doesn't it look like a real sea creature? Here's a side-by-side comparison so you can see the costume in the daytime and at night. The paint is non-toxic and works on a variety of materials. So far we've used it on fabric and paper and had great results. Neat, right? If you'd like to learn about more ILoveToCreate products and projects, you can follow them on Facebook, Twitter, or Pinterest! 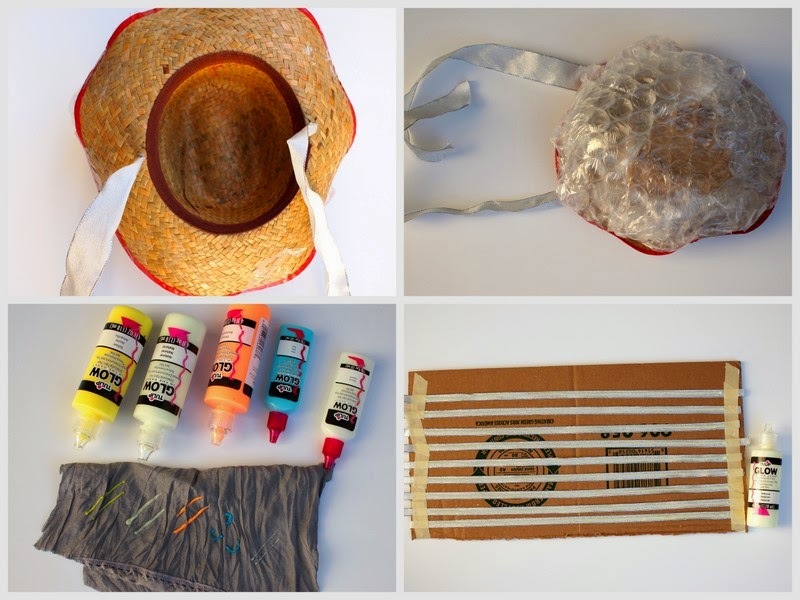 And here are some other great projects that also use Tulip's glow in the dark/ black light!